After an intense stand-off between President Trump and Democrats, the President signed the remaining spending bills and declared a national emergency. 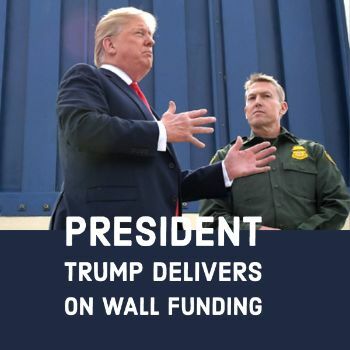 The $333 trillion budget was less than desired, but with the accompaniment of Presidential action, the wall is well underway. Once again, Congress had little time to read the 1,169-page bill which means many of our Representatives did not know what they were voting for or against. The good news is the President received $75 million more for his border wall than Democrats originally offered, and there were no provisions to continue DACA (Deferred Action for Childhood Arrivals) or TPS (temporary protected status). However, this came at a price. The bill provided an exemption for illegal immigrant sponsors of unaccompanied alien children (UACs), even if they have been convicted of a crime. These same sponsors have a history of paying cartels to smuggle in children, putting them at risk for human trafficking, assault, and abandonment. In addition, the bill increases guest worker visas, reduces detention beds to those illegally crossing, and enforces a hiring freeze for ICE’s Enforcement and Removals Operations division. Shortly after the bill was signed, President Trump declared a national emergency to divert money from various agencies in order to protect the southern border. In addition to the $1.375 billion from the budget bill, the plan is to use $600 million from the Treasury Department’s drug forfeiture fund, $6.1 million from the Department of Defense’s drug interdiction program and military construction account. Many opponents from the left have labeled the national emergency as illegal with 16 states immediately filing lawsuits. However, this is a completely legal action that is outlined by the National Emergencies Act of 1976 and has been frequently used by Presidents since then. In fact, nearly 58 national emergencies have been declared since 1979 with many still in effect. For years, top government officials have recognized the immigration crisis. Former Arizona Governor Janet Napolitano and former New Mexico Governor Bill Richardson both declared state emergencies pertaining to the border in 2005. Former Presidents George W. Bush and Obama even directed military assistance to secure the southern border. Despite what the far-left and media may say, this is not a new issue and should have an excellent chance of being upheld in the Supreme Court. Eagle Forum looks forward to the completion of the wall at the southern border. We will keep you updated on the progress of these actions.